American Roll Formed Products Corporation (“ARF”) is a leading ISO 9001-2008 certified, custom fabricator of roll formed steel products and related services, as well as welded tubing, turret punching, stamping, and laser cutting. MelCap Partners acted as the sell-side advisor to American Roll Form. 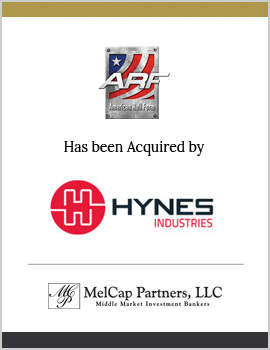 American Roll Form was sold to Hynes Industries, a portfolio company of Resilience Capital Partners.